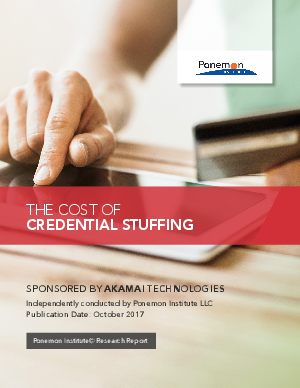 Ponemon Institute surveyed 569 individuals in IT security who are familiar with credential stuffing and are responsible for the security of their companies’ Internet properties. The survey identified key stats about credential stuffing, including the costs organizations incur to prevent damage, and the financial consequences when attackers succeed. According to respondents, these attacks cause costly application downtime, loss of customers, and involvement of IT security that can result in a cost of millions of dollars. The survey highlights the challenges in identifying who is accessing their websites using stolen credentials, as well as the difficulty in preventing and remediating these attacks.